You will be picked up at the airport by a representative from AA safaris and tours ltd and he will take your to your hotel in Kampala for a night as you wait to start your Adventure Uganda Safari the next day. However if you arrive early, you may get an opportunity to find you some entertainment depending on which events of the day are there in Kampala. Luxury; Sheraton hotel/ Serena hotel. You will start on the journey to Rwenzori Mountain national Park from Kampala immediately after breakfast and you will go through Kasese town before you arrive at Rwenzori mountaineering services (RMS) offices. You will have a break along the way for lunch and then proceed but your dinner will be at the lodge where you will spend the night which is either. In the morning just after break fast, you will be briefed and fully equipped with the your guides and porters set off hiking from trail head(1646m) walking past typical mud Bakonjo homes and gradually moving up through elephant grass and garden plots. The trail follows the Mubuku River and therefore you will have to climb over rock and bluff, before reaching the Mahoma River. Then you will go through the open bracken fern slopes and podorcapus forest finding you way up to Nyabitaba hut. On your way up, you may see and hear chimpanzees and sometimes the black and white colobus monkeys and blue monkeys as well as the colored Rwenzori Turaco. 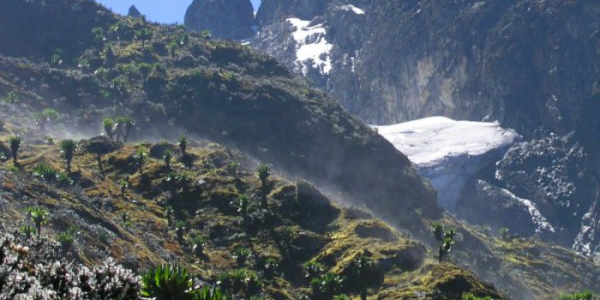 The total time for an average hiker from Nyakalengija to Nyabitaba hut is 5-7 hours. You will spend the night at Nyabitaba hut. After breakfast, you will continue from where you stopped and from here may be required to get up early enough since this circuit is somewhat the long. From this hut the trail leads west wards and then drops takes you to the Kurt Shaffer bridge crossing the Bujuku and Mubuku rivers. You begin to climb the central circuit anticlockwise the side in the clockwise direction is much more difficult and many be very dangerous to you and your porters. You will have to go through the muddy, slippery trail that goes up through bamboo forests, all covered with that slippery moss on the ground. You will precede to Nyamiliju hut an accompanying rock shelter where you will spend the night. How ever if you are still strong and still have time you can continue to John Matte. And you will go through those challenging bog full of amazing plants and you may have go slow if you want to take some pictures. The time taken from Nyabitaba hut to John Matte is seven hours and the elevation is about 3000ft (915m) then, you can spend a night at Matte Hut. After breakfast, cross the Bujuku River and enter the lower bigo bog, here you will have to jump from tussock to tussock on grassy bog. There is a steeply section from the hut which will lead you to upper Bigo bog. At the last half of the Bigo bog a board walk has been constructed this makes the walking easier and prevents the hikers from further damaging the bog. After the crisscrossing the river you will reach lake Bujuku. The southern end of the lake is in the majestic setting, with Mt. Baker to the south, Mt. Stanley to the west, and Mt Speke to the North. The trail route along The Lake’s Northeastern shore crosses the most challenging mud on the trip. Beyond the lake there is a rock shelter called “cooking pot” and a short distance further is Bujuku hut. Usually the hut is very cold due to the mist. Time spent is a bout five hours to get to that hut and the Elevation gained is 1800ft (560m). If you go fro a nature walk, you will have a chance to see Duikers and at night the calls of the rock Hyraxes are common. You will leave fro Elena hut in the morning after breakfast, leave directly to a newer trail which rises and falls and finally climbs through magical moss draped groundswell vegetation at 14345ft (4372m) to Scott Elliot pass. The ascension to Elena is a steep rock trail which when wet or icy can be slippery. Slightly ahead there is a sheltered spot below the pass where you can make a stop over. From here go straight to Elena Hut which is the base camp for climbing 16763ft(5109m) to Margherita peak in the mount Stanley complex, this can be done in a day or two and can be attempted with an axe, mountain boots, crampons, ropes and prior arrangements with Rwenzori Mountaineering Services guides. This trail then continues over Scott Elliot pass and enters an alpine zone of sparse low vegetation. This will give chance to enjoy North of Margherita peak as you are leaving the pass. You will need about 3-4 hours. The elevation gained 1400ft (425m). Your dinner and over night will be at Elena hut. Usually, by the time people get to this point, they are already tired therefore for those who might not manage or do not wish to climb Margherita peak due to unexpected altitude sickness and fog making their climbing ability lesser, there is an option so you can keep going on the left via Scott Elliot pass to Kitandara lake. This will take you beautiful scenery and finally connect you to a two day descending stretch. For those who will still feel fit, they will climb up to the summit of Margherita (5109m); here crampons and roping up may be necessary. Then descend to Kitandara hut and Stay here.(4023m). After breakfast, descend to Gae Yeoman via a steep but enjoyable hour-long climb from the base of Mt. Baker. On a clear day one may also take a view at the Democratic Republic of Congo on the west of Mt. Stanley. The descending continues to Bujangolo rock shelters; the base camp for the historic expedition by Duke Arbuzzi in 1906. Time taken to reach Gae Yeoman hut from Kitandara is about 5-6 hours. After breakfast, you will slope down to Nyakalengija trail head (1600m) park headquarters. This can take two to three hours depending on your body fitness. Carry on to your hotel for lunch and relax. You may have a short walk around till late in the evening. Day 11: Depart for Kampala. After breakfast you will drive back to Kampala and the guide will drop you at your hotel or at the airport if you are leaving on that day. 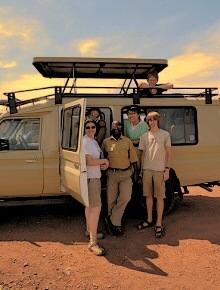 End of Uganda Hiking Safari with AA safaris and Tours ltd.